It’s past midnight in Yellowstone National Park and the wolves are out. A chorus of howls cuts through the starry silence near Mammoth Hot Springs Campsite. It’s the wildest of sounds, matched only by a bull elk’s bugle, which, at a certain time of year, would be the alarm clock to the wolves’ lullaby. Of course, my left-brain knows that unless you’re one of those elk—and a sick or elderly one at that—the park’s burgeoning population of grey wolves is of little concern. With zero wolf attacks on record, Yellowstone visitors are far more likely to be injured by dehydration or hypothermia than canis lupus. Still, while solo camping in a flimsy nylon tent—foggy from a nightcap and a long day afield—my right-brain is in control. I pull the hood of my mummy bag tight and remind myself the nearby rustling is certainly a sagebrush in the breeze and not at all a circling wolfpack. Though marked by infrastructure to support its 3.5 million annual visitors, it’s nice to know most of Yellowstone National Park’s nearly 9,000-sq-km remains untamed. Accessed via Montana, Idaho or Wyoming, and toured through a 230-km-long figure-eight of paved roadway, Yellowstone is boundless in recreation. 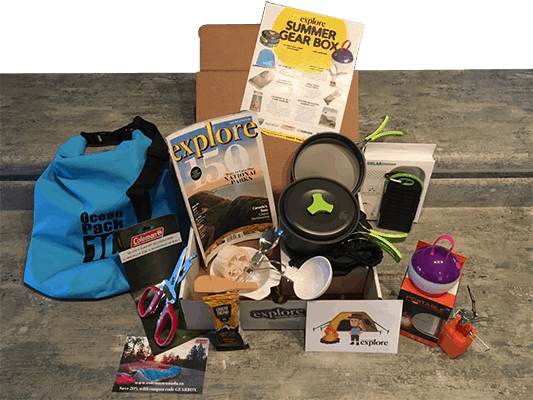 More than 1,800 km of trails, from a half-hour on a boardwalk to a week in the backcountry, await. Abundant wildlife—elk, antelope, bison, wolf, bears and sheep, to name just a few of the 67 mammals—plus otherworldly volcanic formations, explosive geysers, soothing hot springs, rushing rivers and windswept plains decorate these high-altitude hinterlands. 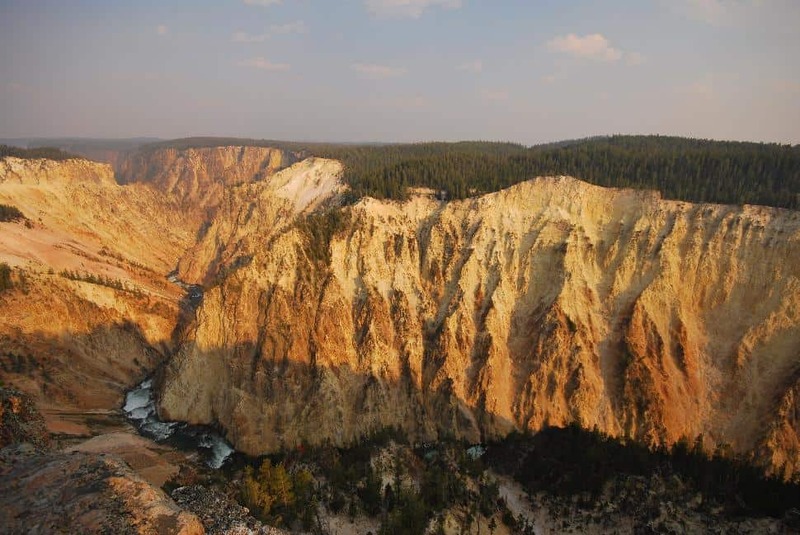 Formed in 1872 as the world’s first national park, the creation of Yellowstone led to the conception of the U.S. National Park Service—a government branch set to commemorate a century of operation this August. Canadians typically enter Yellowstone at the North Gate, passing through Gardiner, Montana and under the iconic stone gateway of Roosevelt Arch. It had taken me two days to arrive here on my motorcycle from Vancouver, British Columbia. 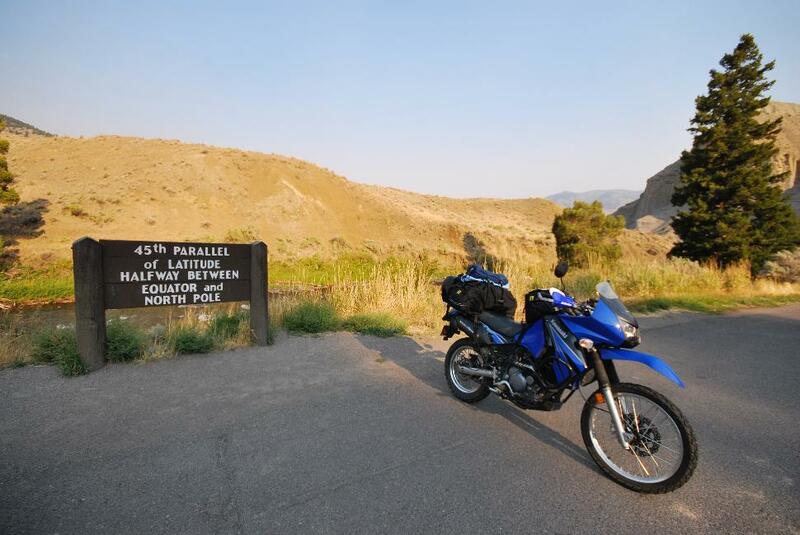 Finding a vacant tent-pad at Mammoth Hot Springs was a welcome victory after a trip made on a bike more suited to logging roads than interstates. With a weekend timeline—when a week would just scratch the surface of this wild land—I quickly set out to hit the hotspots speckled within Yellowstone’s vibrant caldera. 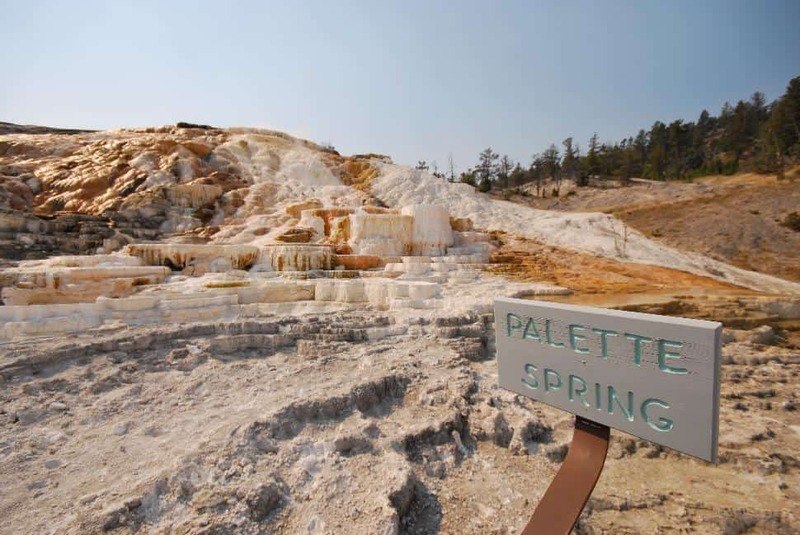 A fine introduction to the landscape of the park, Mammoth Hot Springs offers a boardwalked hike through stacks of cream-coloured travertine deposits. Names like Minerva Terrace, Palette Spring and Liberty Cap denote structures that seem carved by human hand, rather than elementally forged and painted with algae. Heading south through the volcanic environs toward Old Faithful, it becomes apparent, despite being Yellowstone’s main attraction, that famed water-spout is but a voice in the chorus. 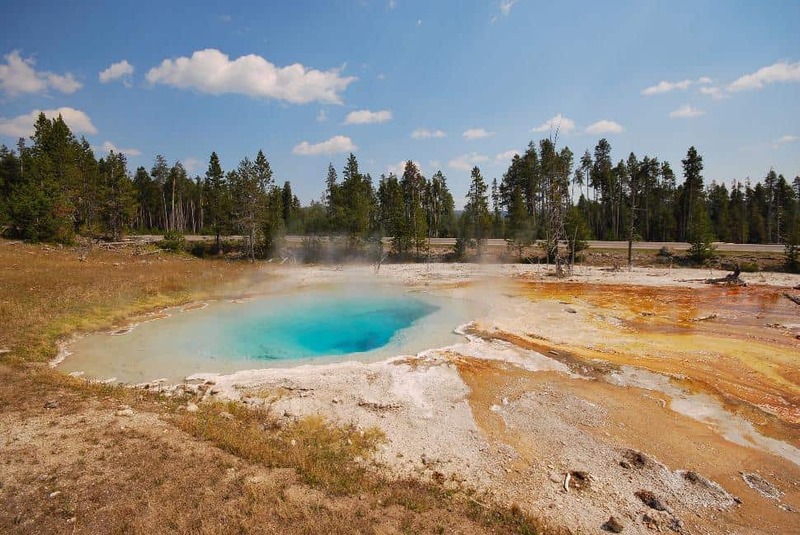 Frothy geysers and boiling springs—more than 10,000 hydrothermal features in total—dot the park as common as pinecones. I soon arrive at Bacteria Mat and Fountain Paint Pots. 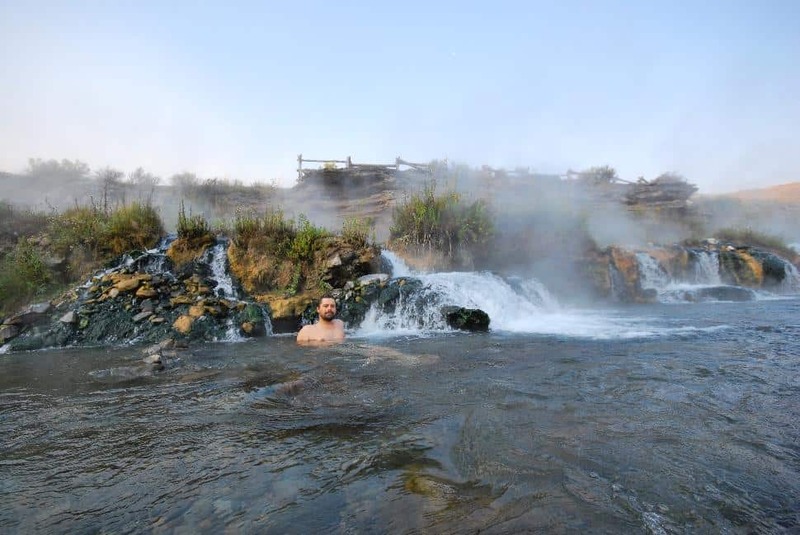 The former is a natural petri dish; a rainbow-coloured hot springs rich with thermophilic microbes, hardy organisms that can survive boiling temperatures. The latter is a formidable pit of pink-and-grey mud that bubbles from within the supervolcano at 95 degrees Celsius. Nearby Spasm Geyser lives up to its moniker with furious spouting that drenches me in sulfur-scented mist as I try to sneak past between spurts. It’s part of the Clepsydra Geyser system, which has erupted almost without pause since fully unleashed by an earthquake in 1959. 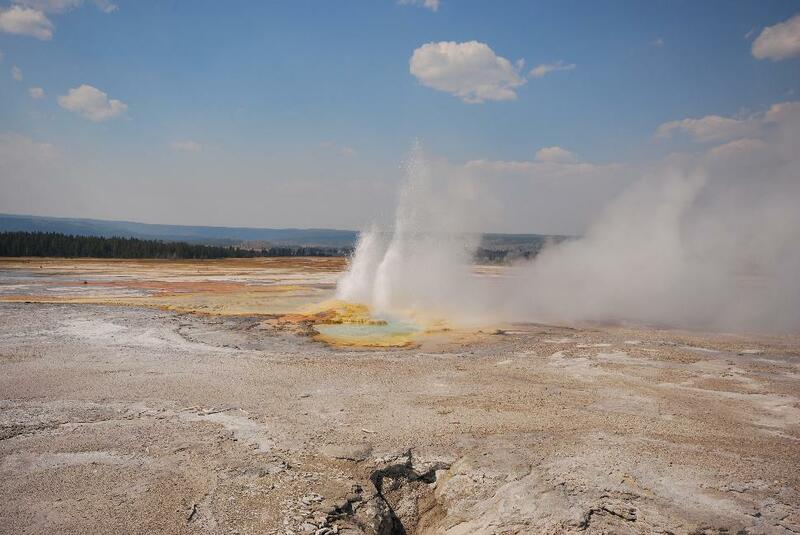 Spoiled by such natural wonders, when I finally reach Old Faithful, also the site of a historic lodge and tour busses unloading gawkers for the regularly scheduled show, the highly-developed attraction seems anticlimactic. Seated on metal benches 100 metres from the geyser, we crowd around Old Faithful like concert-goers. I watch one eruption, impressive though it is, hike for a glimpse at nearby Castle Geyser, and leave the crowds posthaste. 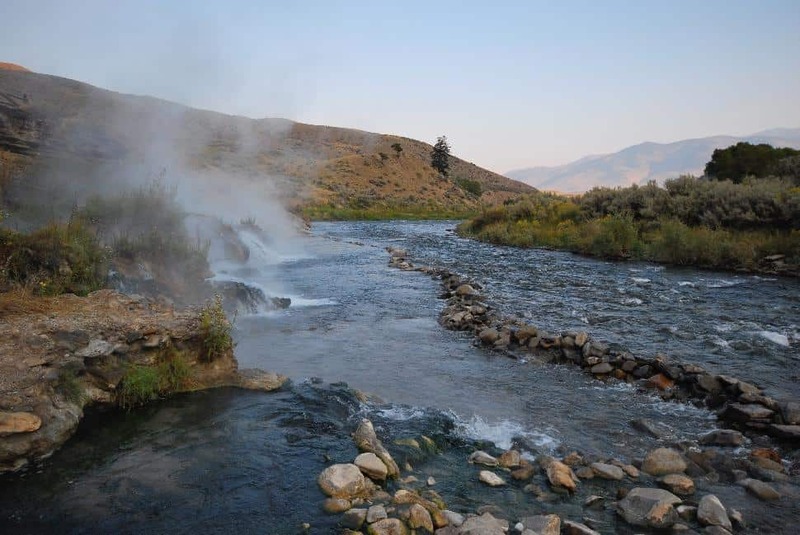 After a chilly overnight at my 2,000-metre-elevation campground, I’m eager for a long soak in Boiling River Hot Springs. I’m up at sunrise for a short hike alongside the Gardiner River to where the icy freestone stream joins a scalding spring. The two opposing temperatures mix within a rock-walled pool, forming what is likely the loveliest natural bath on Earth—especially in the serenity of the pearl-coloured dawn. Two hedonistic hours pass; I drag my thermally relaxed body from the steam as the first fellow travellers filter in. Tucked away and scarcely signed, it would be easy to miss Boiling River. Much like the beauty of Yellowstone itself, discovering the spring requires an eye for detail. Yellowstone is not always as in-your-face as Banff or nearby Grand Teton, but therein lies its uniqueness. More than simply another mountain vista, it’s a cacophony of textures, where one quadrant bears little resemblance to the next. It can be odd-duck and even subtle at times—with one exception. In the northeast corner, the road rises to 2,700 metres, looming above an alpine meadow dotted with grazing bison and prancing pronghorn antelope. And as it descends south to the Grand Canyon of the Yellowstone, I’m treated to the most majestic of all the park’s viewpoints—a 350-metre-deep ravine, tinted by oxidization, carved by the Yellowstone River and punctuated with two dramatic cascades thundering through the valley floor. Rock music, a rocket to the moon, the Internet—America has had some great ideas. National parks, however, might just be the best of the bunch. 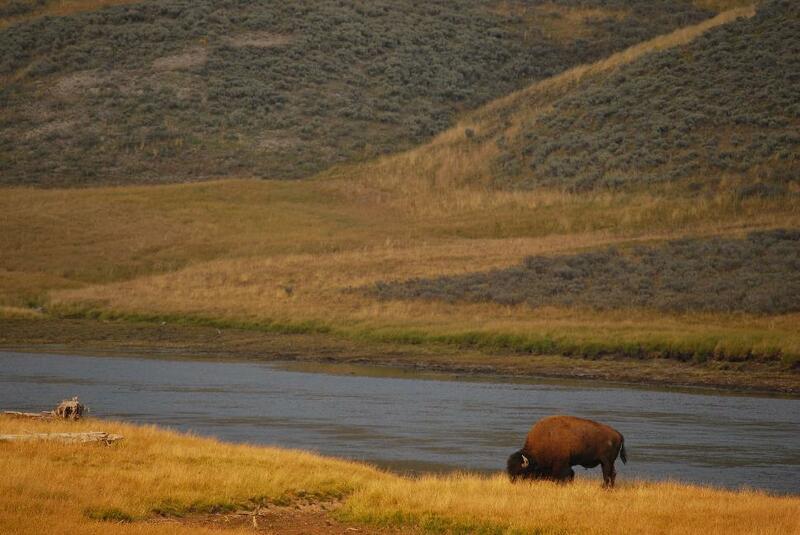 And Yellowstone—wild and rugged, yet inviting and accessible—might just be the best of the parks. Grand Teton National Park, Wyoming: Home to arguably the prettiest peaks in America and conveniently located at the southern edge of Yellowstone. 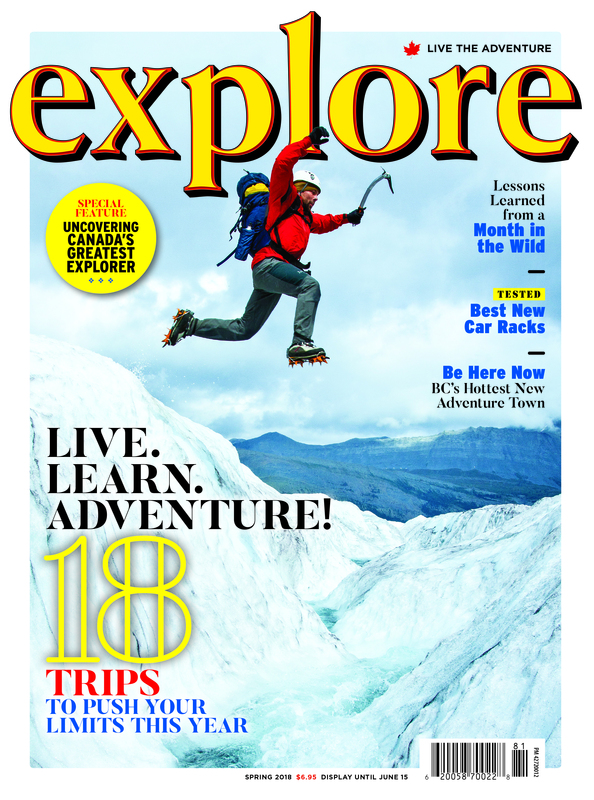 In summer, hike the 60-km Teton Crest Trail. Jackson Hole, Wyoming: The coolest mountain town in the U.S.A. With Wild West heritage, easy access to the Grand Tetons and mountain-resort recreation year-round, Jackson’s a must-visit. Craters of the Moon National Monument & Preserve, Idaho: Drive through the barren environs of southern Idaho, past Arco—the first city in the world to be lit by atomic energy and home to America’s only fatal nuclear meltdown—to these unexpected, lunar-like lava flows.